Despite the rich history and overwhelming social capital held by its diverse community, the Bronx sadly remains one of the nation’s poorest urban counties. Plagued by numerous healthy and safety concerns, the Bronx has also become a frequent subject for academic research with the goal of better understanding the issues of the community in order to bring about improvements. However, this type of research—especially within the Bronx—has been rife with misconduct and abuse. 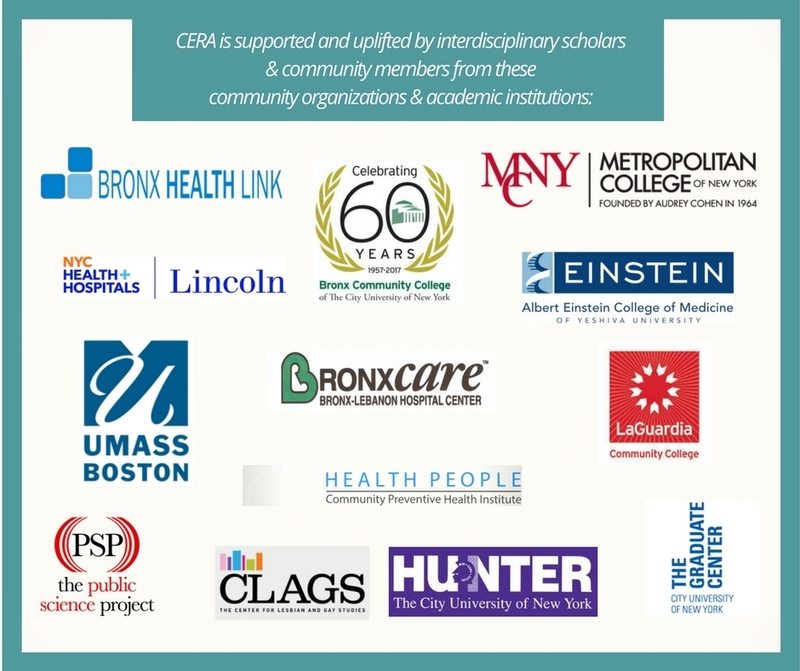 The Community Engaged Research Academy (CERA) Project, which includes the appointment of 30 Community Experts trained to work in conjunction with researchers, seeks to ensure that Bronx residents have the proper knowledge and information in order to protect the interests of their community, particularly vulnerable populations that would otherwise become the victims of institutional abuse once again. One of the most significant challenges Bronx community members face is a lack of information, which has historically resulted in academic researchers and other institutions taking advantage of their vulnerabilities. The ill effects of these abuses can appear in a variety of ways, from excluding certain groups to skew results to actually placing the participants in harm’s way. It is with these miscarriages of ethical responsibility in mind that the Bronx Community Research Review Board< has been fighting for the rights of all those who live and work in the Bronx. Along with our regular efforts to act as a liaison between our community and the research instructions that wish to study us, we are developing CERA as a means of further empowering Bronxites to take an active role in any and all research endeavors that may affect them. At its core, CERA is about bringing more education and information to Bronx residents so that they can better understand the effects and intentions of research projects taking place within their community. One of the cornerstones of this goal is the Community Expert, an adaptive role that will reflect the ever-changing needs and demands of the Bronx itself. Through a combination of quantitative and qualitative instructional exercises and educational courses, which incorporate Technology of Participation methodologies as well as hands-on training, CERA will help 30 members of the Bronx community learn everything they need in order to safeguard the rights and the wellbeing of their fellow Bronxites. The training will allow these Community Experts to work directly with researchers in order to better understand their needs and to help properly collect community input before any project moves forward. Other aspects of the Community Expert role include creating and disseminating surveys to the community, establishing interactive websites to spread information to relevant parties and holding meetings to introduce the research concepts to the community at large. The Community Experts will also help to train other members of the community to participate in the study in new ways, such as holding focus groups or working in conjunction with researchers to collect more accurate information.